From this year superfibre wi-fi not only in structure but also on the beach! The beach of Alba Adriatica is known as "The Silver Beach": one of the most popular and appreciated stretches of sea in Abruzzo. Come and spend an unforgettable holiday with your family in one of the best hotels on the Adriatic coast. 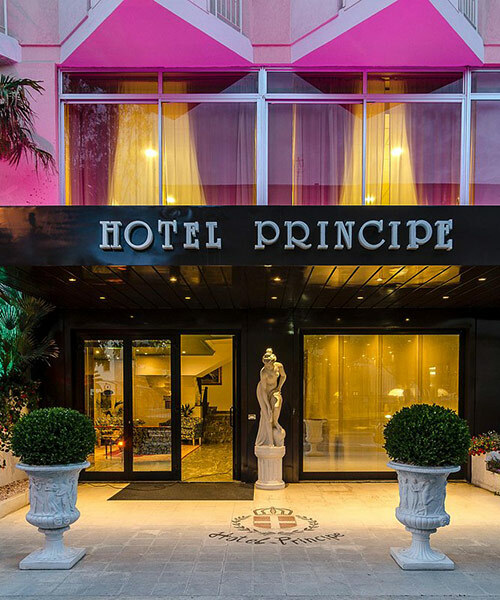 Hotel Principe, a beachfront hotel in Alba Adriatica, in Abruzzo, offers its guests rooms with balcony, private bathroom with shower, hairdryer, TV, telephone and safe-deposit box. Starting with your children will be a pleasure, especially when staying in a hotel where the needs of all the members of the family are the priority. Welcome to the “Principe Hotel” of Alba Adriatica. Our hotel has been entirely renovated and is situated at a walking distance from Alba Adriatica seaside. It is provided with all the facilities and comforts an up-to-date hotel must offer to its guests. In short, it is an ideal place for a relaxing holiday. The Principe Hotel has got one of the largest private beaches at Alba Adriatica, an enclosed and very spacious car park partly built underground, a gymnasium richly equipped , a playground for children, bike service and many other facilities. Our hotel is well-known for its cuisine which offers a menu that varies everyday so to meet every preferences of our guests. The Chiesas, who manage the hotel since its beginning and take special care of its hospitality tradition, are also restaurateurs. It’s many years since they manage the well-known restaurant “Il Vigneto del Principe” (Prince’s Vineyard) which is on the hills overlooking Alba Adriatica, and is preferred by people all the year round for weddings, lunch parties, and other ceremonies. Would you like to explore the seafront of Alba Adriatica by bike all together? If Italy is the garden of Europe, our coast and its hinterland are still its happy island. Surrounded by greenery, Abruzzo finds its dimension gently sloping from the hills to the Adriatic Sea. Hotel Principe of Alba Adriatica, silver beach in the heart of the Adriatic coast. "The holiday that everyone would like"
Service, cleanliness, courtesy (from all staff), excellent cuisine and pleasant location are adjectives that everyone would want to be included in their vacation, with certainty my family and I have lived them all and I can not fail to recommend this excellent. ..